These days, software engineering presumes that the software products organizations deliver are becoming more complex in terms of functionality, scale, and problems they solve. As a result, not only the development part, but also the actual QA approaches become more sophisticated. Consequently, testing becomes too expensive and inefficient for large complicated projects and the software products risk to be launched live with errors. We are not saying that testing is not efficient any more. Our approach is all about being forward looking. Nowadays organizations need to think strategically when trying to predict and identify poor or defective code before it can cause consequences in material losses and market competitiveness. Unexpected defects are hidden among different software levels and multiple technology infrastructure especially when the end product is a large and complex solution. Due to our proactive approach to defection prevention, your IT budget won�t be wasted in vain. Source code analysis and review based on source code metrics reduces risks and improves code quality throughout the entire software development life cycle. Developers can use codeNforcer for quick review of their source code with the purpose of improving its architecture. Architects and managers can check the accuracy of the developed source code, its development speed, and the availability of comments. QA engineers can complete tasks of analyzing the source code and provide developers with recommendations on how to fix the most important problems. If you are an independent software engineering expert or an architect working for several companies and require a quick tool for source code quality review, the cloud-based version of codeNforcer is exactly what you need. With codeNforcer, SMEs can check the quality of software they receive from their outsourcing contractors. By doing so, you can be sure that the code you have paid money for can be developed and expanded in a proper manner in the future. For post-secondary schools, colleges or universities there is a special offer: any higher education institution can get codeNforcer with a 50% discount. Using codeNforcer in hands-on tutorials helps students improve their skills, develop and deeper their knowledge in the field of software programming. As a result, students become more self-determined, motivated and proficient. 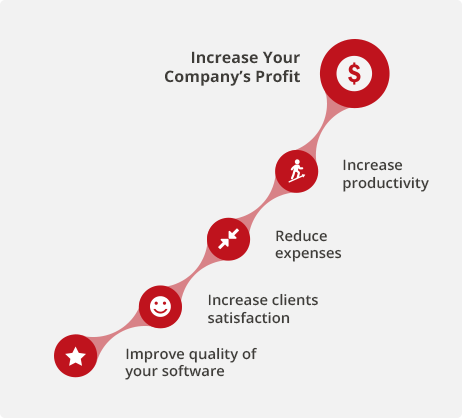 Don't delay your software improvement process. Give a chance to codeNforcer and start right now!